Did you know you can now order your Deliveroo takeaway from Clockjack here on View? Clockjack is a chicken restaurant that offers a concise choice of starters, mains and desserts. "We are passionate about our chicken. We source free range birds, marinate them in a secret-recipe, soft herb brine and cook them on our special vertical rotisserie. This gives the skin its delicious browning whilst keeping the meat succulent and juicy, bringing out the natural flavour of good quality chicken. Also on our menu are our acclaimed buttermilk chicken bites and 5 great flavours of wings; a gourmet chicken burger; vegetarian options and a help-yourself salad counter, freshly prepared for each lunchtime. We deliver locally and can cater for local office requirements. Grab yourself a tasty and healthy lunch to eat in or take-away or have a great value dinner in Soho in the heart of London. We're very close to the Piccadilly Theatre and close to Piccadilly underground station. Sunday and Monday are BYO days - no corkage charges! By the way, in case you're wondering, a "Clockjack" is the name for a traditional roasting spit - they've been used from Tudor times!" We take bookings - visit our website! You can click and collect at a time that suits you- visit our website! What did you think of Clockjack? We were looking for a convenient place for lunch and came across Clockjack, just beside the Piccadilly theatre. The restaurant was initially quiet but the glowing vertical rotisserie looked great with its chickens spinning round. Our waiter was very friendly and the service was good. H recommended the Clockjack Sliders - 3 mini burgers with different fillings. 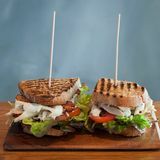 I had those and my partner had the chicken and side of help-yourself-salad from the selection of salads on the counter. The "sliders" were really good and the chicken came out very juicy and tasty. We will be back. Clockjack Oven puts all its eggs in one basket, serving one meat only: rotisserie chicken. 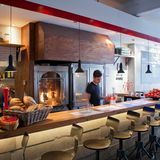 Just around the corner from Piccadilly Circus, Clockjack Oven is tucked away on unassuming Denman Street. A short strut from Brasserie Zedel and Hix, and directly opposite Jamie Oliver's newest labour of love – rumoured to be a Union Jacks – the restaurant lies in a culinary hot spot, with a lot to live up to thanks to some pretty impressive neighbours. The interior is casual and minimalist, yet emanating a wholesome feel – much like the food. Mixing metallics and dark wood, Clockjack has gone back to nature. It even satisfies your inner caveman, with a counter for diners to watch their chooks slowly browning on the upright rotisserie. The atmosphere is warm and welcoming. Staff jump to attention and are passionate about sharing the Clockjack story, from the sourcing of the produce to the mechanics of the rotisserie itself. Before you've even picked up the menu, there's tap water on the table. If can't abate your appetite, a selection of sneaky appetisers include marinated olives, salted almonds and root vegetable crisps which, at a push you can just about convince yourself are one of your five a day. The menu says it all: 'Simply roasted and free range' - it's not a lie. With chicken the only meat on the menu, the meat at Clockjack is simple; roasted and reared roaming free in the fields of Brittany. 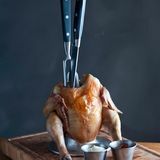 With its unique vertical rotisserie, Clockjack chickens are marinated and slow roasted, allowing the fats to drip down and the flesh to gently cook to retain its moisture. The result? Succulent and hearty roast chicken, that'll transport you to a quintessential farmer's cottage and thoughts of his wife's signature roast. Although chicken is the only option, it does come in various forms. 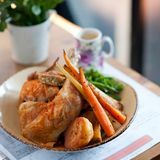 For the traditionalists, there's rotisserie portions of three (£6.95) and four pieces (£8.95), or a whole chicken (10 pieces - £17.95) to share. Sides (£2.95-£3.95) are simple yet satisfying, like the main event. Tomato and red onion salad is fresh and juicy and the house 'slaw is mayonnaised to perfection; the double cooked chips aren't bad either. For the health-conscious, there's the chicken house salad (£8.95), with shredded rotisserie chicken, apple and crispy sage and onion balls – which is also the vegetarian option, sans chicken. To start, try the crispy chicken bites (£4.95), little nuggets of meaty goodness, marinated in buttermilk, coated in seasoned gram flour and lightly fried for a pleasing crunch. The real winners however, are Clockjack's homemade sauces: creamy, garlic ranch; tangy BBQ; tongue tingling chilli; and rich caesar. Pour, dip, mix or smother, it's a condiment lover's dream and you'll be hard pressed not to guzzle them all. Fill your boots - they're complimentary, come in abundance and hands down make the meal. For those dubious about ordering red with a white meat – rest assured, all of Clockjack's wines have been specially chosen to complement chicken – handy that. With a modest but adequate selection, bottles are priced from £14.95, but with just three beers and a handle of soft drinks, it's clear that chicken rules the roost. 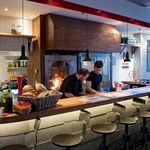 Clockjack Oven has all the charm of a new independent – friendly staff, a warm environment and a noticeable eagerness to please. While this is what gives it the edge, chicken is chicken, however well roasted. With plans to expand across the capital and 15 sites rumoured in the next five years, lets hope it manages to retain its character. If not, with Nando's such a success, there might not be enough room for two in the hen house.